First, preheat oven to 200 ° – 225 ° F. After that, wWash and dry the tomatoes. Line a dripping pan with a sheet of parchment paper and spread over the paper half the salt and the sugar. Cut the tomatoes in half and put them on the baking tray, then spread the other part of salt and sugar over the tomatoes halves. bake for 10 to 14 hours. After 8-10 hours, check the tomatoes and take out from the oven those of them ready. Finally, place the tomatoes on a rack, covering them with a clean cloth. Meanwhile the tomatoes are cooking, line a pot with clean cloths, then insert the preserving jars and caps and fill the pot with water to 2 inches above the jars. After that, place the pot on the heat and let it boil up 20-25 minutes. Lastly, take out jars and cups from the water with the help of pliers (do not touch the inside of the vessel and cap). Let dry jars and caps upside on a clean cloth, until completely dry. Check the vessels are perfectly dried, then insert the tomatoes into the jars, alternating peppercorns, dried oregano, and olive oil. Press the tomatoes to let out all the air and check that all the tomatoes are thoroughly submerged before closing the cap. Finally, store the jars in a dark, cool, and dry place. 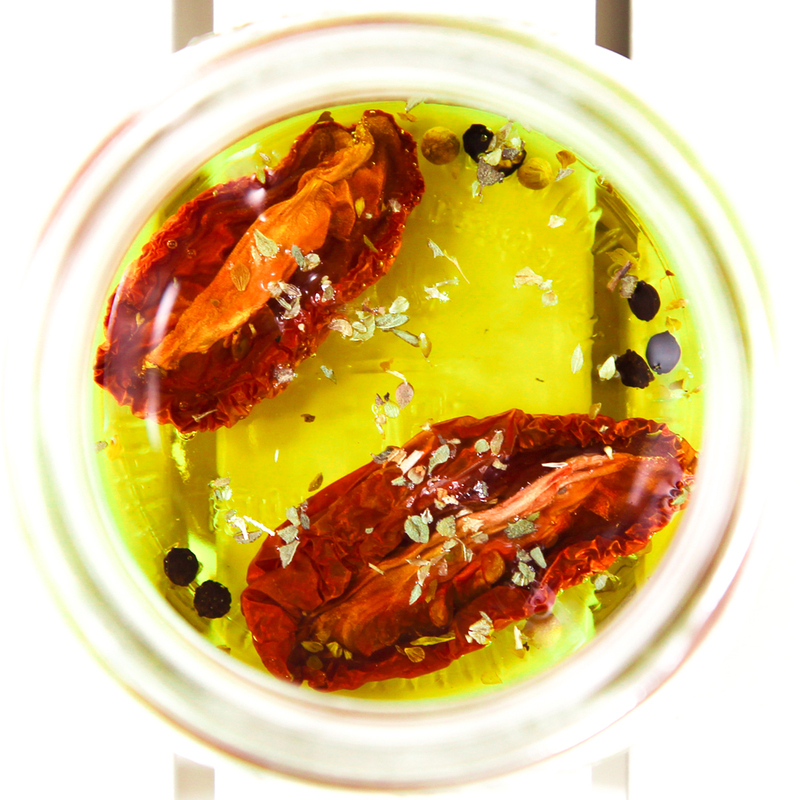 After 1, 3, and 7 days, open the jars and check if sun-dried tomatoes are still completely submerged in oil: otherwise, add more oil. To be safer, many people pasteurize the jars at 175 ° F for 10 minutes. Personally, I think that this step is not necessary if the other steps of sterilization were followed perfectly, and contributes only to alter the properties of the oil. If stored in the right way, the tomatoes will be ready after 30 days and will last up to one year. Before sampling the tomatoes, open the jar and check that there are no mold or weird discoloration. August, time of jarred food! 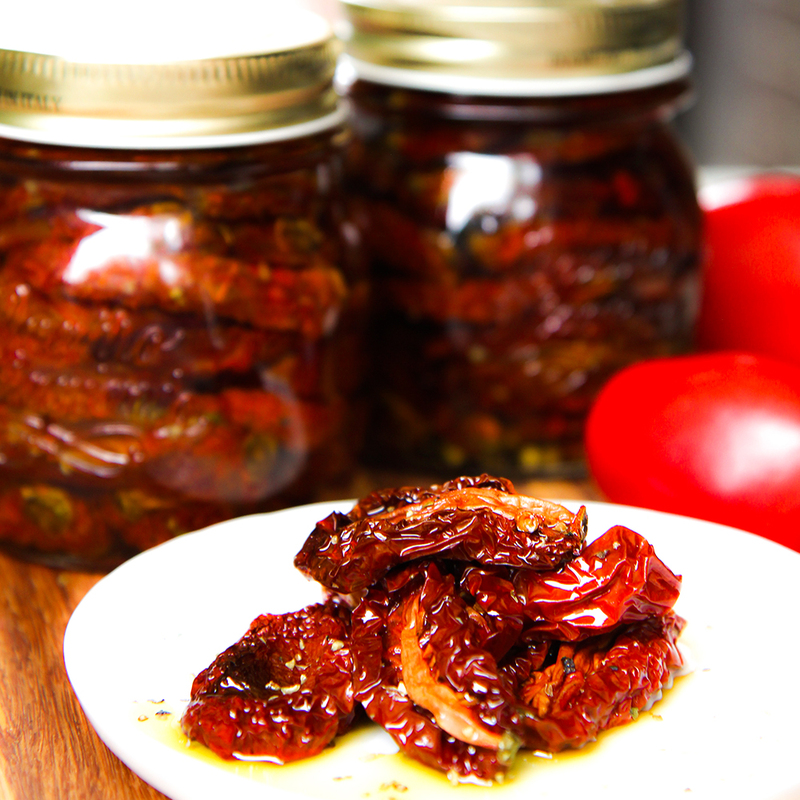 Here a summer classic: The sun-dried tomatoes. 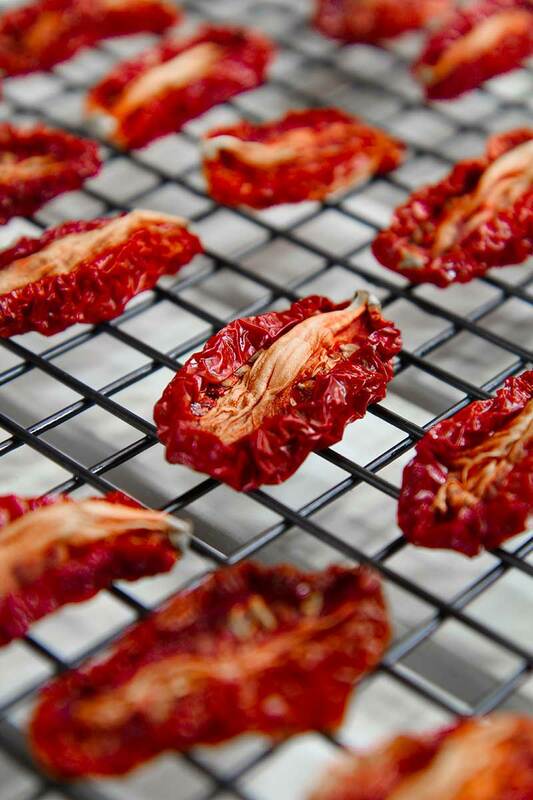 To prepare dried tomatoes in the traditional way it takes a week of sun. Umm ... a week... fortunately, there is another way to make delicious dried tomatoes in "only" 10 to 14 hours! This process is not fast, but the result is delicious, and it will comfort on cold winter days, bringing a little 'sun even in December, unless you live in California, lucky guys! First, preheat oven to 200 ° - 225 ° F. After that, wWash and dry the tomatoes. Line a dripping pan with a sheet of parchment paper and spread over the paper half the salt and the sugar. Cut the tomatoes in half and put them on the baking tray, then spread the other part of salt and sugar over the tomatoes halves. bake for 10 to 14 hours. After 8-10 hours, check the tomatoes and take out from the oven those of them ready. Finally, place the tomatoes on a rack, covering them with a clean cloth. The oven temperature you state cant be right, they would surely be burnt to a crisp at those temps for that long! Hello Mr carpenter, I prepared 10 jars of tomatoes following these recipe, no one burnt (take a look at my pictures). Have you tried to prepare these? Just a consideration: the temperature I wrote are in Fahrenheit, not Celsius! Maybe you are confusing the temperature with Celcius? The temperature is correct (200-225°F). You want the tomatoes dried not baked, simulating the action of the sun in the oven. I will surely try this. I need to learn canning first. I’m excited! WELL DONE ARTICLE – BRAVO!!!! If you decide to make the tomatoes, let me know if you like them. What is the total yield of this recipe? The recipe quantites are set for about 3 pint jars. Can you use cherry tomoatoes? And what about a dehydrator?? 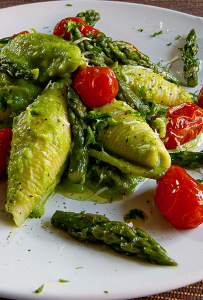 Yes, technically you can make this also with cherry tomatoes, but likely the timing will be different. And, yes, you can use a dehydrator, but it need some testing to set the right temp and timing. can I add red wine vinegar after I added the oil? Forgot to dipp the tomatos . I bought some sundried tomatos and spices in Italy, after tasting the one that was infused in olive oil, I love the texture and taste so I want to learn how to make my own.